NOW YOU CAN save the weight of a set of Titanium Rods for thousands less, for every pound you take off the Spinning Weight of your Chevy Drive Train. It’s like getting 9 1/2 more Horsepower! This Chevy U-Joint weighs 2 1/2 lbs. 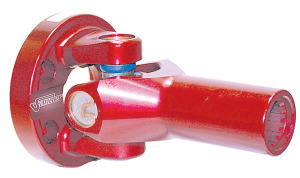 less than normal spicier style models and eliminates the Crank Flange and Mounting Bolts. Comes With Flange Bolts & U-Joint Spring.